Mmmmmm, this is a very moreish meal indeed! Every part of it is yum, yum, yum! The dukkah and the dahl recipes are both converted for the thermomix from Hugh Fearnley-Whittingstall’s River Cottage Veg Everyday. I’m sure I’ve mentioned before (probably many times now) how obsessed I am with Hugh FW and River Cottage; the food, the ethos, the happiness and peace, I love it all. The Veg everyday book is just fantastic and I wholeheartedly and wholestomachly recommend it. This meal also wouldn’t be complete without Quirky Jo’s spelt tortillas, so a big thank you to Jo! Now, let’s launch in to the recipe! 1) If you are making spelt tortillas to serve with the meal, make the dough now and set aside in an oiled bowl (wipe a thin layer of oil over the top of the dough also, to prevent it from drying out as it stands, then cover the bowl with foil). Clean and thoroughly dry TM bowl. 2) Put pistachios, cumin seeds, coriander seeds and sesame seeds in TM bowl. Dry toast for 12 minutes on 100 degrees, speed 1. Allow to cool. 3) Add mint leaves and sea salt to bowl (with cooled nuts and spices), and pulse on 1 second bursts on turbo to grind. Check after each pulse; you want it finely chopped, but not too fine. It should only take a few pulses. 4) Preheat oven to 180 degrees celsius. Set aside dukkah while you start the lentils. No need to clean the bowl at this stage. 5) Put lentils and water in TM bowl. Cook for 20 minutes, 100 degrees, speed 1. The lentils should break down and go very soft while you get the fish and tortillas going. 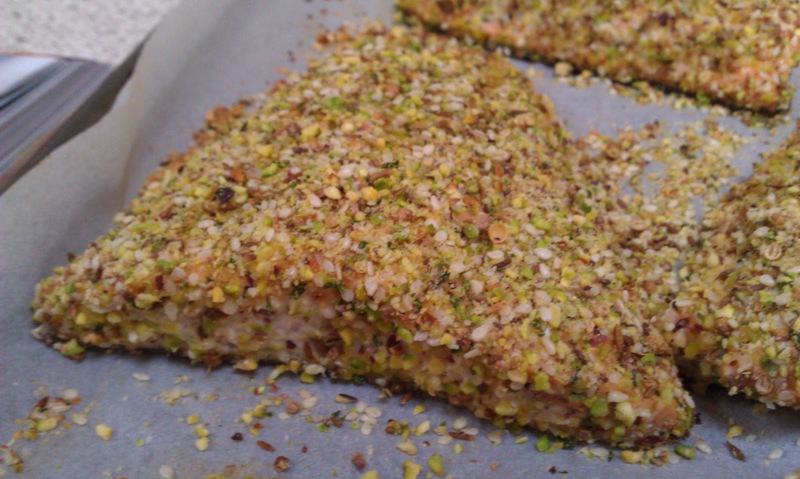 6) As soon as you get the lentils on, coat the salmon liberally in dukkah (cover a plate with dukkah and press the salmon down on the dukkah, turn over and repeat – covering the top, bottom and sides of the salmon fillet with dukkah). Repeat with all fillets and place on a lined baking tray. You may want to set the tray aside and wait until the lentils only have 10 minutes remaining before you put the salmon in the oven; that way you won’t have a time lag between the fish being ready and the lentils being ready. Cook the salmon for 15-20 minutes in the oven (maybe more, depending on the thickness of your salmon fillets). 7) Meanwhile, move on to rolling out and cooking the spelt tortillas (refer to Jo’s recipe and video, linked to earlier in this post, for rolling and cooking instructions). 8) When the lentils are cooked, pour into thermoserver. Scrape as much out of the bowl as you can, but still no need to wash the bowl. Add onion to TM bowl, chop for 3-5 seconds on speed 7. Add oil and cumin seeds and saute for 8-10 minutes, 100 degrees, speed 1. While the onions are cooking, keep going with the tortillas if you haven’t cooked them all yet. Once onions finish cooking, add them to the thermoserver with the lentils and stir with the spatula to mix well. 9) Put everything on the table, and everyone can serve themselves! You can serve the salmon and lentils on the plate with a tortilla on the side, or you can make a ‘burrito’ of sorts by putting some of the salmon and some lentils into a tortilla. It’s a very filling meal, so work on a maximum of one salmon fillet per person (perhaps less!). Leftover dukkah can be put on just about anything; sprinkle it on salads or soups, or just dip some torn up bread into olive oil and then into the dukkah for a snack with a little flair!